It's been too cold to go outdoors, so I've been hard at work making cards for my next OWH box. 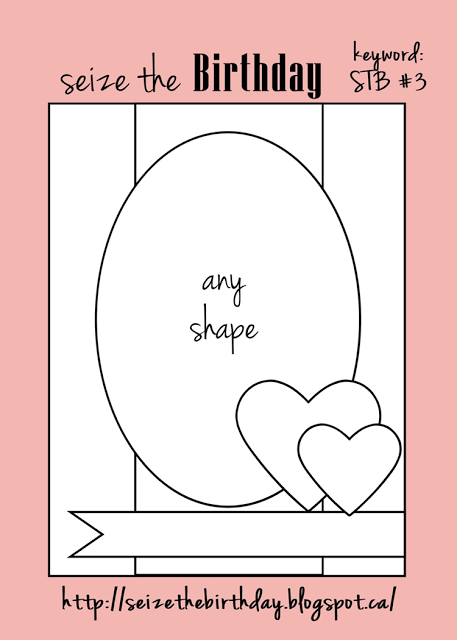 This card is for the Simon Says Stamp challenge to do some paper piecing, as well as the OWH Stars and Stamps mid-week throwdown to make Easter cards. I'm also entering it into the MFP Speedy Fox & Friends challenge #143 to use twine on your card. I paper pieced all the chicks using 2 different polka dot papers, adding a touch of color to their beaks, tails and feathers. The border is a fabulous exclusive Simon Says Stamp border die called "Pinpoint Border" that I won recently! 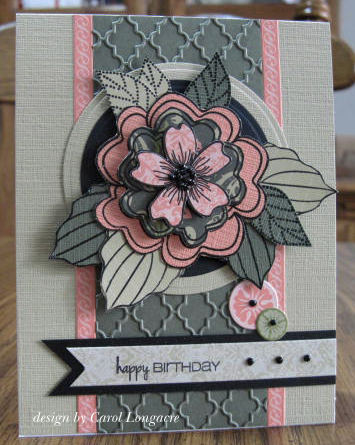 I adore border dies like this where I can insert different colored pieces of cardstock for interest. I trimmed it down to a narrow width so it didn't overpower the tiny chicks. The stamp set is one I picked up for a $1 and it's by G studio. For the final touch, I just added a little twine. This card is for the Seize the Birthday#3 to make a feminine birthday card. Unfortunately, my card didn't really photograph well, as green colors always seem to turn out wonky for me. I used papers and card stock from a retired SU! scrapbook kit that I've had for years. I also added artichoke and river rock card stock. I layered the HA flower & leaves, and paper pieced them with 3 different papers from the kit, popping each layer up on dimensionals. The coral borders and 2 smaller circles are stickers from the kit. The artichoke panel was done with a CB Decorative Tiles ef, and the sentiment is from CAS-ual Friday stamps. I added some black rhinestones from Pizzazz Aplenty for the flower center, circle centers, and sentiment panel. The sentiment panel was also a border sticker that I just cut down to fit. I don't know what I'm doing wrong, or what setting on my camera is off, but my photos always appear to be blurry, but clicking on them brings them into focus?! We're bracing for a little snow here in PA later on this afternoon, so I'll probably be making a few more challenge cards today! Thanks for stopping by and keep warm! Carol, your cards are beautiful! I love the gray one especially, it's breathtaking. Your little paper piced chicks are just too cute, Carol. And, the next card is a beauty. I love the flower. Snow? Send me some. We just have rain, rain. I can't keep up with you, girlie! You rocked these! Paper piecing the peeps was brilliant, and the gray and pink is blowing me away! Carol, those little chicks are precious!!!! Love the use of the die too. Cute card! Your second card is smashing! Those colors are so pretty together and love the flower! Glad you played in Seize the Birthday too! 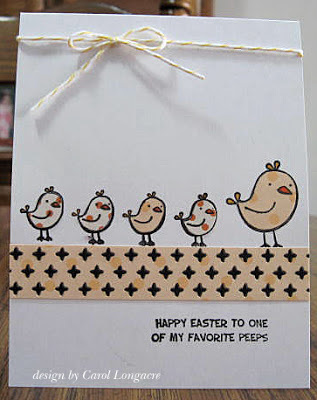 Carol your Easter card is so sweet, love the border die. ANd the birthday car is fabulous, love the colors and the details. Great cards! Love your Seize the Birthday Entry! Fabulous layering! Great cards! I LOVE your flower card ALOT!! It's beautiful! What great cards! I really love how cute the top one is and then the embossing on the second card with the colors and layers of the flowers...beautiful! Easter!!!??? You are too good girl! so pretty! thanks for playing along at Seize the Birthday! Both cards are adorable, Carol! Love your Easter one with those cute little chicks and the die you used! It's really neat how you change out the colors with these dies! Your flower card is just awesome! So many different things of interest on there to look at! Pretty embossing and I love the colors! Nice job on both! Nothing better to do one these cold/snowy days than to stamp.....although I haven't been to my stamp room since Wednesday because life is getting in the away the last 2 days but you better bet today is MY day to stamp! Hubby's got supper all wrapped up for tonight and chores are done!! This makes me a happy girl! Have a great day & stay warm!!! Your feminine birthday card is a beauty. The layered flower is fabulous! We have snow here as well. Stay warm. Both fabulous card Caron, I love the sweet little chicks on your CAS card. Your paper pieced flower is beautiful - a wonderful design and colours! !